Someone shot a Heartland REMC substation transformer. 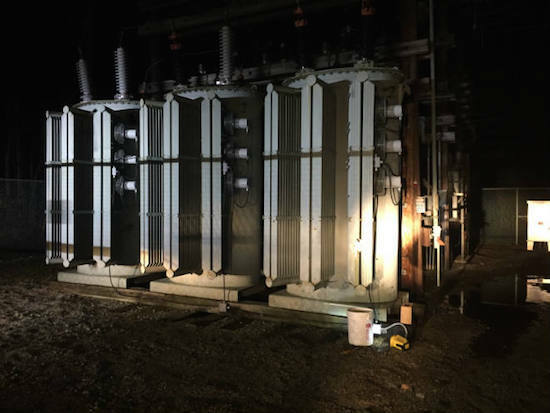 Over $400,000 in damage occurred at a Heartland REMC substation in Wabash, IN, on November 25 after someone shot the transformer, officials said. The substation is near the Red Bridge Marina on Mississinewa Reservoir Property. The substation lost power that night after someone shot the substation transformer, according to Indiana Conservation officers. REMC personnel discovered the bullet hole in the substation transformer that had penetrated the radiator. Other bullet damage was apparent on the outside of the transformer, but did not penetrate it. REMC personnel did find spent rifle cartridges nearby which officers will examine as possible evidence. Damages to the substation are at least $400,000 or more. REMC Chief Executive Rob Pearson said evidence indicates the perpetrator stood at the locked gate entrance and fired at least two rounds, since all of the holes in the transformer were made by the same gun. From the location of the shots as well as the number of shots, the shooting is believed to be an intentional act to damage Heartland REMC property, Pearson said. Pearson said the damage also caused a hazardous oil leak around the substation, which had to be cleaned up. This is the second time someone has shot and damaged the substation. Pearson said the equipment suffered similar damage from a bullet earlier this year.